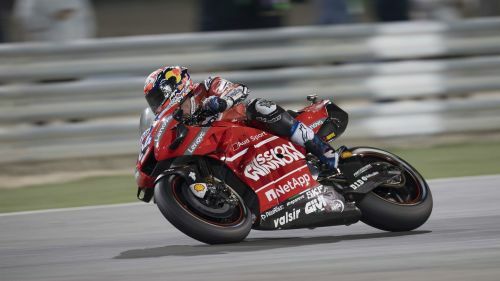 Andrea Dovizioso kicked off the 2019 MotoGP season with victory at the Qatar Grand Prix after a gripping battle with defending champion Marc Marquez. Starting from second on the grid, Dovizioso got away superbly and overtook pole-sitter Maverick Vinales for the lead into the first corner. Marquez also started well and the pair began a sensational tussle that saw them both have time at the front of the race. A daring last-corner move from Marquez got him in front of Dovizioso, but the Italian's line was better in the drag race to the finish and he crossed first – as he did 12 months ago in Qatar. Vinales had a miserable start as was quickly down to sixth as his rivals surged past him, the Suzukis of Alex Rins and Joan Mir particularly impressive. Jack Miller also made a strong impression, but his race was hampered by a seat problem and, having dropped down the order, he was eventually forced to retire. While Miller toiled, the Suzuki duo took the fight to Dovizioso and Marquez, with Rins pushing the front two hard in the first half of the race. Early on Rins was even at the head of the leading pack, but his straight-line speed meant pulling away was tough and his dreams of a maiden victory in the premier class began to fall away. That left a straight battle between Dovizioso and Marquez, with Danilo Petrucci and Cal Crutchlow putting themselves in with a podium chance. A mistake by Rins with three laps to go ended his chances, the Spaniard allowing Crutchlow through to watch the fight for victory from third. Marquez found a way through on lap 20 but at the start of the final circuit Dovizioso used his speed to retake the lead, though there was still to be more drama. Somehow Marquez spotted a gap at the final corner and although he completed the move, Dovizioso was wise to him and pulled away to take a thrilling win.